The Imperial apartments mark the final third of the self-guided tour of the Hofburg palace interiors. 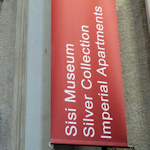 You enter immediately after passing through the Sisi Museum and it takes you through around 20 rooms. The areas you see are just a tiny part of the entire complex, but they include the rooms used by Empress Elisabeth and Emperor Franz Joseph in the latter half of the 19th century. There is no spectacular opulence for us to gawp at, but the furniture and decor offer intriguing clues to the character of their Imperial occupants. Be sure to listen to your (free) audio guide, as it provides the historical context, plus offers little bonuses, like an original recording of Franz Joseph ending an audience. Almost immediately you begin to understand the work ethic and sense of responsibility that guided Franz Joseph throughout his life. And if you paid attention in the Sisi Museum, you’re immediately struck by the contrast to his wife, who you might feel fought for exactly the opposite. The audience chamber offers a taste of the colours and styles to come, with the neo-rococo furnishings in gold and white, and the red silk damask upholstery. It’s the study and bedroom, though, that bring Franz Joseph to life. Although he was not the most progressive of monarchs, two qualities shine through in the functional bed, the spartan dressing table, the early starts (he was up at 3.30) and large portraits of Sisi that look down on his work space: a hard worker and a man in love. And then there’s Sisi. Also a hard worker (on her riding skills, looks, languages and thirst for travel and distraction) and a woman in love (with herself). I’m exaggerating, but the contrast to Franz Joseph is clear. The Emperor would ring a bell to enter Elisabeth’s apartments and give her attendants time to get out of the way. I wondered if she dreaded that sound or welcomed it? The dressing room is the most poignant for me. It features its own fitness equipment, like two rings hanging incongruously under a doorway. Not what you expect in an Empress’s dressing room (not what the court expected, either). But then Elisabeth wasn’t like other Empresses. The portraits and photos in this room are not dominated by Franz Joseph and her immediate family, but by her Bavarian family back home and her favourite poet, Heinrich Heine. I can’t figure her out, frankly. Part of me admires her rebellion against court protocol and traditions, and feels sorry for a dreamer who was uprooted from a happy home and “forced” into the confines of Habsburg ceremony and expectation. And part of me thinks she was too self-indulgent and perhaps unnecessarily provocative. I wonder how Franz Joseph felt about her choice of wall decoration. Did he care? Did she care? It’s a little sad. All the wealth of an empire won’t help when your wife falls out of love with you (if she ever was truly in love with you). This romance did not have the happiest of endings. Don’t skip the bathroom -Sisi had hers put in in 1876. At the time, washing mostly involved portable items (wash bowls, chamber pots etc.) which you can see in the Silberkammer (rooms “3” and “4”). The tour of the apartments ends with a few extra rooms that remind you that you’re passing through some pretty serious history. For example, there are the Alexander apartments, where Tsar Alexander I of Russia stayed during the Congress of Vienna in 1814/1815. And the Red Salon features furniture and Gobelin tapestries given to Emperor Joseph II by King Louis XVI of France in 1777. At the end you’ll see the dining room, decked out as if for a family dinner. Unfortunately it was being cleaned when I was there, but you can catch a glimpse at the official website. And then you’re at the end of your Hofburg palace tour. I recommend it – as it’s self-guided, you can go through as slowly or as quickly as you like. And the rich information available in English gives you a lot of interesting insight into the workings of Habsburg life. Perhaps most importantly, you get to learn a little about the personalities, foibles, failings and frustrations of the Imperial family. At the end of the day, just another family trying to get by (albeit with a mountain of servants, palaces and privileges).